October 22, 2012 - Bombardier Aerospace announced on Monday that the cockpit and all fuselage sections for the CSeries aircraft’s first flight test vehicle (FTV1) have arrived at Mirabel, Québec, and that the assembly of FTV1 is in progress. Additionally, the first wings for the all-new CSeries aircraft are now being mated to the test airframe that will be used during the Complete Airframe Static Test (CAST). Bombardier also announced that testing of the avionics, electrical, flight control, fly-by-wire, hydraulic, landing gear and wiring systems for the CSeries aircraft, as well as virtual flights, are progressing steadily at Mirabel on ‘Aircraft 0’ − the on-the-ground Integrated Systems Test and Certification Rig (ISTCR) for the CSeries aircraft. Located at the company’s Experimental Test Facility in St-Laurent, Quebec, the CAST is designed to demonstrate the static strength of the airframe and show compliance with certification requirements. The Mirabel facility will be the production site for the CSeries aircraft and the assembly process will include a fully automated moving line using the latest lean manufacturing principles. “The CAST, FTV1 and ‘Aircraft 0’ are all key elements in the testing and development of the CSeries aircraft and we are delighted with the progress on each of these three test platforms, said Rob Dewar, Vice President and General Manager, CSeries, Bombardier Commercial Aircraft. The CSeries aircraft wings were built at Bombardier’s new, state-of-the-art 600,000-sq.-ft. (55,742-sq.-m) manufacturing and assembly facility in Belfast, Northern Ireland, which is responsible for the design, manufacture and integration of the advanced composite wings for the CS100 and CS300 jets, including all flight control surfaces and high-lift systems. The use of resin impregnation has enabled the manufacturing of larger and more complex composite structures in the aviation industry. Bombardier Aerospace Belfast has been at the forefront of that manufacturing revolution, developing and patenting its unique Resin Transfer Infusion (RTI) process that is now being used in manufacturing the primary structural components of the wings for the CSeries aircraft. The use of composites in such a large structure as the wing provides weight savings, but additional benefits to customers include fewer inspections and therefore lower maintenance costs, thanks to the corrosion resistance properties and fatigue strength of the composite material. The composite manufacturing process being employed at Bombardier Aerospace, Belfast also permits a high degree of accuracy and aero smoothness to minimize drag and therefore reduce the CSeries aircraft’s fuel burn. The advanced technology, carbon-fiber wings for both the CS100 and CS300 aircraft have an approximate area of 1,209-sq.-ft. and a span of 115 ft. 1 in. While some of the internal parts for the wings of the two models will be different, they have the same aerodynamic profile. During the CAST, the wing and other components of the airframe will be subjected to a series of load cases representing flight maneuvers, landing, take-off and other in-flight and on-ground conditions to test the strength of the airframe. For selected load cases, internal cabin pressure will also be applied when simulating in-flight conditions. Data collected will be monitored by Bombardier’s stress engineers, as well as by the partners and suppliers that are involved in the development of structural components for the CSeries aircraft. As in the production of the wings for the CSeries aircraft, Bombardier has capitalized on its expertise in composites technology in the development of the airliner’s aft fuselage. For the carbon-fiber aft fuselage, including the pressure dome, the company is utilizing Automated Fiber Placement (AFP) techniques. Bombardier's adaptation of AFP technology, which is also utilizing robotic technology, has benefited from the largest collaborative aircraft structures demonstration project initiated by Canada’s National Research Council to advance AFP use in the aerospace industry. Bombardier is employing a brand new moving line in manufacturing the cockpit for the CSeries aircraft at its St-Laurent facility. The line has been designed using lean manufacturing principles in order to ensure safety for the company’s employees, enhance product quality and provide flawless execution for on-time delivery. CSeries aircraft, designed for the growing 100- to 149-seat market, the 100 per cent new CSeries aircraft family combines advanced materials, leading-edge technology and proven methods to meet commercial airline requirements in 2013 and beyond. Powered by Pratt & Whitney PurePower PW1500G engines, the CSeries aircraft family will offer a 15 per cent cash operating cost advantage and a 20 per cent fuel burn advantage. The CSeries aircraft’s clean-sheet design will permit the aircraft to achieve greatly reduced noise and emissions, as well as superior operational flexibility, exceptional airfield performance and a range of 2,950 nm. The CSeries aircraft will be up to 12,000 lbs (5,443 kg)** lighter than other aircraft in the same seat category and will provide passengers with a best-in-class, widebody cabin environment in a single-aisle aircraft. The 13 customers that have joined the CSeries aircraft program, nine with firm orders – include major network carriers, national carriers, premium airlines serving city centre airports, a low-cost airline, leasing companies and a full service provider to airline partners. 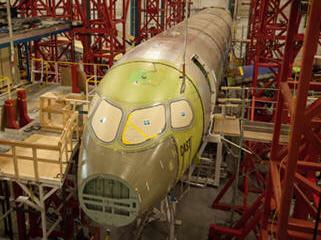 Bombardier has booked orders and commitments for 352 CSeries aircraft.